Rediff.com » Cricket » Will Khawaja recover in time for India Tests? Will Khawaja recover in time for India Tests? Australia coach Justin Langer is hopeful Usman Khawaja will be fit to face India in the first Test in early December despite the top order batsman undergoing knee surgery on Wednesday. 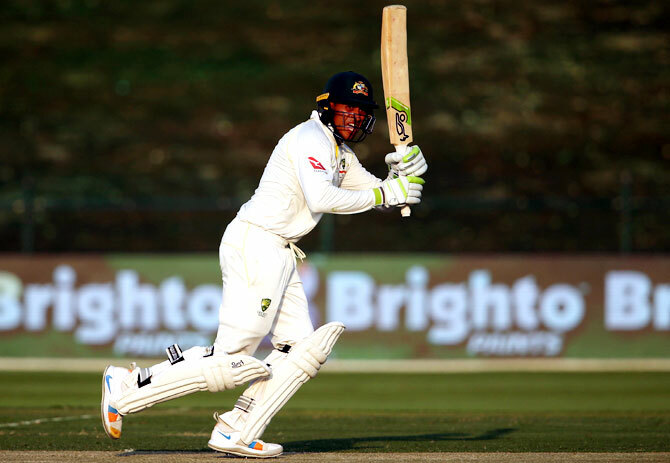 Khawaja's batting was one of the few bright spots in Australia's first Test series since the suspension of Steve Smith, David Warner and Cameron Bancroft -- a 1-0 loss to Pakistan in the United Arab Emirates. The 31-year-old scored 85 and 141 in the drawn first match before injuring his knee while training during the second Test loss, putting in doubt his participation in the four-match home series against the top-ranked Indian tourists. His loss for even part of the series would be a huge blow to a team already missing so much batting experience because of the Cape Town ball-tampering scandal but Langer said on Wednesday he has some grounds for optimism. "My understanding is that he had surgery this morning, so I haven't heard the results yet," Langer told Melbourne's SEN radio. "But hopefully, some of my messages yesterday were that he might be up for the (Sheffield) Shield game before the first Test match, which would be a real bonus for us." While Australians will be confident about their bowling for the India series, the batting looked fragile against Pakistan and local pundits have suggested that, in the absence of Khawaja, the top six spots in the order would be up for grabs. Former Test opener Langer said he thought Khawaja, opener Aaron Finch and all-rounder Marnus Labuschagne had enjoyed good series but accepted that positions in the top order are open. "When you continue to bat like we are batting in Australian cricket at the moment, it's always open," Langer said. "I think we've had 25 batting collapses in the last three years. It's very open because we're not performing. "When you take out Steve Smith, David Warner and Cameron Bancroft from the Test side, you are always going to be challenged," he added. "We had three guys make their debuts and senior players like Usman Khawaja and Shaun Marsh -- who didn't have a great series as has been well documented -- you need those players to stand up." The debate over the inclusion in the Test team of top order batsman Shaun Marsh and all-rounder Mitchell Marsh has become almost a tradition in the run-up to the Australian summer and Langer said it is up to the brothers to bring an end to it. "We've got faith in Shaun and Mitch but when you are not performing, I understand why people criticise," he said. "You can only pick on form." Idol respect: Mumbai's awesome Twosome catch up! 'King' Dhoni back to where it all began!